In the 1920s, after the death of his mother, Houdini began focusing his energy on debunking psychics and mediums. Although he eventually focused on proving these people to be fakes, his initial entry into the world of the supernatural began when he attempted to contact his dead mother. However, he found that the mediums he met were often frauds. He began investigating their methods and claims and later became a self-appointed crusader against them. He knew he could duplicate their methods on stage and it was not long before his efforts to reach his mother became secondary to his need to expose the frauds. Ashamed of having masqueraded as a medium during his medicine show days, Houdini began making notes for a book. However, to prove that he did have an open mind, the magician made a pact with his friends that when he died, he would make contact, if at all possible, from the other side. He devised a secret code with his wife Bess so that only she could divine the legitimacy of the message. During personal appearances to promote his moves, Houdini would project slides of various mediums and denounce their supposed supernatural abilities. He would also answer questions about false mediums in various newspapers throughout the country. Though he continued to perform, Houdini spent most of his time focused on exposing what he called "vultures who prey on the bereaved." In fact, Harry would often attend séances in disguise in order to gather evidence, then leap up, tear off his disguise and reveal how the fraud was committed. Like so many of his illusions, these activities received extensive coverage from the press. In 1923, he took time off from his magic act to travel across the country giving lectures against mediums. His book, A Magician Among the Spirits, would be published the following year. Later in 1923, Houdini joined a panel that was put together by Scientific American Magazine, which offered a reward for any medium that could prove their psychic gifts were genuine. Months after joining the committee, Houdini heard the committee had deadlocked over a medium named Mina Crandon. He immediately set out to debunk Crandon by attending one of her séances, at the end of which he is said to have remarked, "I've got her; all fraud." To prove it, Houdini created a special "fraud preventer" cabinet, a crate with a slanted top with openings for the medium's head and arms. The second séance, this time using the cabinet, was not successful and Crandon did not receive the cash prize. In the fall of 1925, Houdini opened a new full-evening show that included his debunking of psychics and mediums. In every city along his route, Houdini offered $10,000 to anyone who could exhibit supernatural phenomena that he could not mirror. The shows sold out all over the country. In the spring of 1926, he returned to New York with the intention of spending the summer months relaxing and devising new mysteries for his fall season. It was during this tour that the show began to be plagued with problems and mishaps and ended with Houdini's death. First, Bess became ill with ptomaine poisoning. Then, a chain slipped during Houdini's famous Chinese Water Torture Cell escape and Harry fractured his ankle. Finally, Houdini received an unexpected punch to the abdomen, which eventually led to his death at the age of 52. Not long after his death, the "Houdini Séances" began with Bess Houdini offering $10,000 to anyone who could help contact her husband. 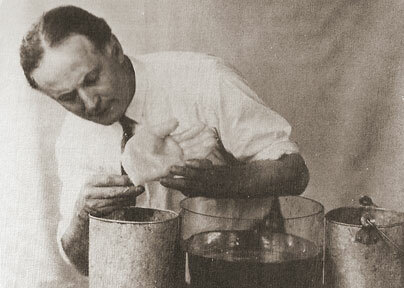 In 1928, a man named Arthur Ford announced that he had received a message from Houdini himself. After reviewing the message, Bess Houdini validated the message as one that indeed used the code shared between her and her husband. Bess continued to hold séances to contact her husband, but the last official séance was held on October 31, 1936. This final séance was covered by radio and broadcast all over the world. The medium called out to Harry to make himself known. However, after over an hour, nothing had occurred and Mrs. Houdini decided to "turn out the light" on her attempts to contact Harry. As the séance came to an end, a violent storm broke out full of thunder and lightening and drenching everyone involved. The participants would later learn that the storm did not occur anywhere else in the area; only above the séance location.